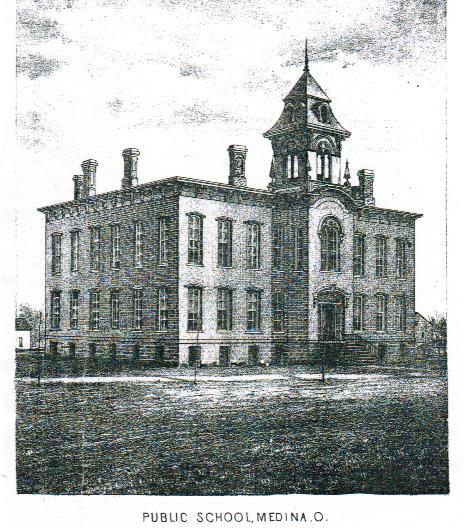 Sketch of the 1872 Lincoln School from the "1881 History of Medina County." Medina may have achieved iconic status in preservation circles after its nationally lauded restoration of Public Square in the late 1960’s — but these efforts came too late to save three landmarks which were once important in the life of the village. The 1872 Lincoln School, the 1891 Medina Primary School and the 1840 Rose Cottage have all vanished without a trace. Only sketches and photographs remain to attest to their existence. Here are their stories. The 1870 fire that destroyed most of downtown Medina was followed by a frantic building boom that resulted in the construction of the Victorian buildings that make Public Square the historic showplace it is today. 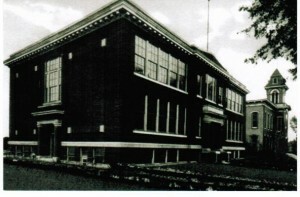 That building boom included the construction of the Lincoln School. This imposing, two story structure with a tower and belfry opened in 1872 and was able to house all the village students, from primary grades through high school under one roof. (Prior to this, students had attended one-room schoolhouses scattered throughout the village.) In fact, Lincoln School was so large that there was space enough to rent to Carver’s Normal School, a college level training program for teachers. The 1881 History of Medina County called it “a temple of learning of which any town might be proud.” It was located on the corner of South Broadway and East Smith Road. Thirty years later, the village had grown so much and student enrollment increased so greatly, that a new school building was needed. In the fall of 1912, a ten room structure was built just north of the Lincoln School. It was named the Garfield School, in honor of Ohio-born President James Garfield, and was separated from the Lincoln School by a narrow walkway. A 24 room addition to the Garfield School was erected in its place. The enlarged Garfield School is still part of the Medina City Schools. Whether it is the nineteenth century or the twenty first, Medina’s problem remains the same – too many students, not enough classroom space. By 1890, the capacious, two-story Lincoln School was filled to capacity. Before the village built the 1912 Garfield School, they constructed this new (and rather short-lived) structure for the primary grades at a cost of $7,687. 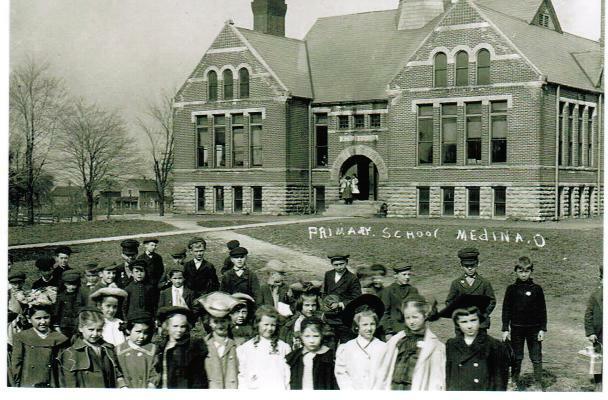 On January 23, 1891, the brick grade school, alternately known as the Medina Primary School or “The Little School”, officially opened. It was located on North Broadway Street, just north of Public Square. It was torn down in 1923 to make way for a large and ultra-modern new Medina High School. In 1976, that high school building was sold to the county and presently serves as the County Administration Building. Hiram Bronson was an important figure in the early days of the village. He owned a dry goods store on the corner of North Court and West Liberty Street (the present day location of the coffee shop, Cool Beans), was elected Sheriff of Medina County while in his twenties and served in the Ohio Legislature from 1865 to 1869. He also owned most of the northwest section of the village. In 1840 he built this lovely, Western Reserve-style home dubbed the Rose Cottage, on the northwest corner of West Liberty and North Elmwood Streets. Thirty years later, the structure was moved to another location on North Elmwood when he decided to build an even more imposing home. 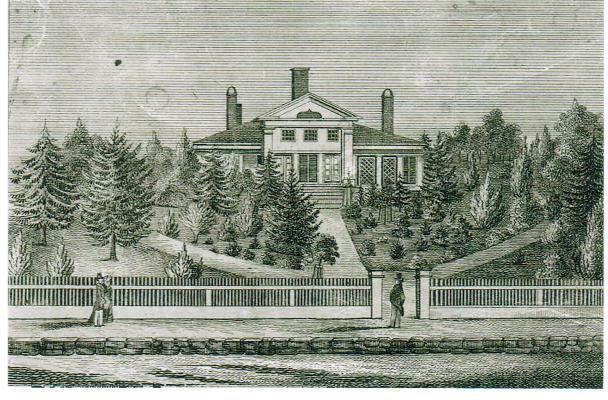 Both the 1840 Rose Cottage and the 1870 home have been torn down. Above is a photo of a painting of the Rose Cottage by Sherman Bronson which currently hangs in the Medina County Historical Society. Thanks for this blog! I moved away from Medina in 1969 but that was where I made the most memories! I want to visit, but until then… your blog fills the bill! 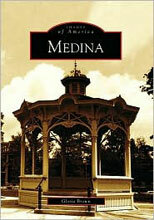 I love the history of Medina and continue to seek out historic Medina info and pics! I lived in Medina during 1956, having migrated from Australia. We lived at 599 South Court St next to the Wagsts. started school at Garfield Elementary and have fond memories of it. One of these was Santa Claus arriving by helicopter, escorted by the fire brigade. The pupils were given candy and red cellophane fire helmets. Don’t know how they would have gone in a fire! My teacher was Miss Macheter (? ), and I remember her as being very nice. I loved the cafeteria, with its melamine trays that would get filled up with food. There was one African-American girl in the class who I sat next to. I don’t remember her name, but i like her a lot. There was a girl who had a dress with coins sewn to it. She would cut off the coins and give them away. Next time she wore it there would be more coins sewn to it, and the same thing would happen. I remember some friends of my parents complaining about the Negros moving into Medina, threatening to move out if ‘one ‘ moved next door to them. I cracked my collarbone when my brother’s toboggan hit me. We would walk across the railway line to go to school and would pass a watchmaker’s store where there were always interesting clockwork tableaux in the window. On that sticks in my memory is of a young girl lashed to the railway tracks. a villain with a curly moustache wearing a black cape would be about to slice the girl in two, while a train would be arriving, just in time to prevent the dastardly deed.There was a common behind our house where the children all played and families would congregate and have picnics. We returned to Australia in 1957 and settled in Sydney, NSW. I now live in a rural town in NSW with a band stand very much like the one in the public square. I have a fridge magnet of the Medina one. I remember the catfish that used to live in a pond in the park- I found them quite disconcerting.